Unless you have been living under a rock for the past few years, you will know that cannabis is now legal in many states, mainly for medicinal purposes. Mary’s Medicinals CBD has been awarded the ‘Best Medical Advancement’ from The Cannabist for two years running now, and many have called them a life-saving company. Mary’s Medicinals is at the forefront of a more natural way out of opioid addiction, thanks to their potent transdermal cannabinoid patches. Aside from the usual suspects (CBD and THC) however, Mary’s Medicinals pride themselves on offering products that are also rich in CBC, CBN, and THCa. While the majority of CBD companies sell CBD in the form of a food supplement, Mary’s Medicinals is a brand that’s committed to changing the way in which we consume cannabis products. They offer a selection of ointments and lotions so you can enjoy the benefits of CBD by applying it directly to your skin. In this complete Mary’s Medicinals CBD oil review, we will be taking a closer look at the brand, what products they sell, who has access to them, and whether or not they’re worth it compared to similar products that you might find in a medical or recreational marijuana dispensary. Who are Mary’s Medicinals CBD? Lynn Honderd is the co-founder and CEO of Mary’s Medicinals, and also the head of Mary’s Foundation for Caring, which is a 501(c)(3) foundation dedicated to patient outreach and education. She has more than 15 years of experience in Capital markets and was instrumental in the successful IPO execution and the marketing strategy for various companies across diverse industry sectors. This experience is what helped Lynn to position Mary’s Medicinals CBD as the leading producer of pharmaceutical-grade cannabis products in various states. As stated on their website, Mary’s Medicinals is not a “singular muse.” The aim is to “advance the global acceptance, understanding, and adoption of cannabis,” as well as other plant-based medicines. They are best known as the developers and exclusive distributors of the award-winning Transdermal Cannabis Patch, and by developing products that maximize the goodness of cannabinoids, terpenes, and other plant nutrients, the brand is truly changing how people view and use cannabis. Not only did Mary’s Medicinals deliver the first transdermal cannabis products, but they were also the first to market the useful benefits of CBN and THCa, as well as discover innovative techniques to isolate CBD. Furthermore, they continue to develop new cutting edge ways to extract, manufacture, and market medicinal cannabis. Mary’s Medicinals CBD has been around since 2013, and thousands of people have turned to them as a trusted source for relief. Their unique products have earned them the highest respect as the most recognized and innovative brand in the nutritional hemp industry. In-house testing: The company has on-site chemists who oversee the testing of all extracts, raw materials, and final products – held to exacting standards of consistency and purity. In fact, Mary’s was the first cannabis product manufacturer in Colorado to get in-house Ultra High-Performance Liquid Chromatography (UHPLC) testing equipment, as well as the staff to support it. Dedication to education: As more people being to explore medical cannabis and its benefits, there’s an increasing need for accurate, objective, and current information. Mary’s works with many organizations and experts in an attempt to educate the community on the latest in cannabis medicine. Awards: Mary’s Medicinals have won multiple awards, which speaks a lot for the quality of their products and the influence that they have in the cannabis industry. Aside from the “Best Medical Advancement” award, they also won the “2014 Invention of the Year Award,” “2017 Most Valuable Brand Award,” and the “2016 Edibles List Award – Best Transdermal,” along with a string of other awards. Community outreach and charitable giving: Mary’s Medicinals have a steadfast commitment to the community. Currently, they work with many organizations, including the American Cannabis Nurses Association, United Patients Group, Patients Out of Time, and Americans for Safe Access and Realm of Caring. News & Events: Mary’s have a “News & Events” tab on their website where you can find multiple different articles on their products, latest developments, partnerships, and more. This is a very in-depth page that covers just about everything you can think of. It’s a great way to keep the public informed and up to date with the brand. Considering that Mary’s Medicinals is one of the leading brands when it comes to innovation, we found it rather odd that they don’t have an online store. On their website, they state that their products are not available for online purchase. Instead, you can purchase through licensed dispensaries in states where cannabis is legal. The other option is to use NuggMD for delivery if possible. Since Mary’s have been around since 2013, one would think that they would have implemented online shopping by now. However, we soon found out that the reason they don’t is because their products are not legal in all 50 states — this is because they are extracted from marijuana and contain THC. 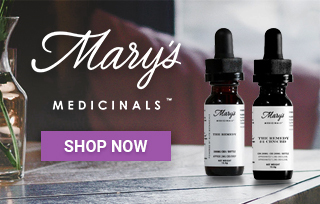 Mary’s Nutritionals, on the other hand, is Mary’s Medicinals “sister company” whose CBD products are made from hemp, and are therefore legal to be shipped to all 50 US states (you can shop online via the Mary’s Nutritionals website). PAX Pod: This is Mary’s 100% natural, pesticide-free THC blend, containing 3:1 CBD:THC and 1:1 CBD:CBN. The pod uses heat control technology to get a superior flavor. The PAX and Mary’s combination results in a great vapor experience. The Remedy THC: This is a highly concentrated 1000 mg THC tincture available in a lemon-lime flavor. It’s sold in a 15 ml bottle that equates to 60 servings. When accurately dosed using the graduated dropper, you should get 16.7mg THC per ¼ mL. Transdermal gel pen: This is one of the fastest-acting and most accurately dosed products available. Accurately dosed, you will get 2 mg per pump and 50 doses per pen. The effects are said to last between 4-6 hours. It’s available in CBN, CBD, Sativa, and Indica. Transdermal patch: The patch can be applied to any venous area of the skin and should provide 8-12 hours of systematic relief. The uptake time is 15 to 30 minutes. The patch is available in six cannabinoid profiles; CBN, CBD, Sativa, Indica, THCa, and 1:1 CBD:THC. Distillate vape kit: The kit includes an adjustable voltage battery that shows draw time and battery life. It’s available in a THC blend, 3:1 THC:CBD, or 1:1 CBD:CBN. The 500 mg Pyrex glass cartridges contain only terpenes and cannabinoids – no additive, fillers, cutting agents, etc. Muscle freeze: This is a CBD-infused topical that give a quick soothing and cooling effect. It has the potential to reduce inflammation and offer pain relief. Relief may last for up to four hours per dose. It’s an easy to use roll-on dispenser. Transdermal compound: Featuring a 100 mg blend of THC and CBD, you can expect fast-acting and localized pain relief. Relief may last for up to three hours per dose. Could be especially helpful for those who suffer from joint pain, nerve pain, and arthritis. Capsules: The capsules are 100% plant-based and when accurately dosed you will get 5 mg per capsule. They’re available in both CBD and CBN. CBN is great for sleeping issues, while CBD is used for anxiety and to help reduce inflammation. Remedy oil: This is Mary’s best selling sublingual tincture, and has the potential to treat anxiety, pain, and inflammation-related issues. It consists of 500 mg of US-grown CBD, cinnamon oil, sweet almond oil, and myrrh oil. Just one single drop under the tongue is equal to a 2 mg dose. The Remedy CBN:CBD: There is 200 mg of both CBN and CBD in one bottle of this blend, and it’s available in a citrus-vanilla flavor. It’s great for sleep and countering discomfort. The effects typically peak after about 90 minutes and can last between four and eight hours. Remedy oil 1:1 by Coltyn: This tincture contains 100 mg of both CBD and THC and creates the sought after “entourage effect.” It has been developed in collaboration with Coltyn Turner and contains about 45 servings per bottle. As we already mentioned earlier, prices are not available online for those who don’t live in one of the qualifying states. However, you can still window shop, and we are pretty sure that if you just give one of the stores a call or do a little bit of searching on the internet, you can find some information regarding prices. Since medical marijuana has started being legalized in more states across the country over the last few years, Mary’s Medicinals is taking full advantage by offering high-quality cannabis products for the masses. An increasing number of people are looking for natural, alternative treatment options to treat issues like pain, and this seems like a winning brand. Simply put, our Mary’s Medicinals CBD review showed that this is a brand with arguably some of the most exciting and unique products of any cannabis business in the industry. They no doubt offer top-shelf products that are worth taking note of, and if you live in a state where cannabis is legal, we highly recommend you give them a try. And of course if you don’t have a medical marijuana card or don’t live in a legalized state, you can shop the brand’s sister company for products that are available in all 50 states. I'm a big kid, so the Sour Gummies are literally a dream come true. They help calm my anxiety and they taste amazing. Johnathan from Ashburn just bough! Adam from Ashburn just bough! Athena from Ashburn just bough!